What’s your RHS (running hair style)? | Eat. Blog. Run. 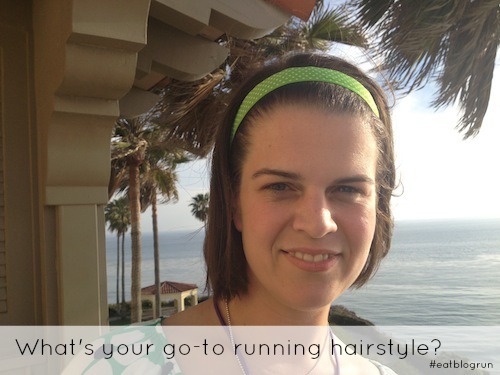 Home >> Blog >> What’s your RHS (running hair style)? On any given running day, I can be found sporting a wicking hat with a ponytail shoved out of the adjustment opening; it’s not glamorous but it it is functional. Melody (pictured above) loves her running headband and hates to get on the road without it. But since the morning of the MCFunRun she couldn’t find it, she is also modeling the basic mid-ponytail below. a. Grand Rapids Kids Melody (also pictured above) has a sleek and high ponytail. b. Make and Takes Marie is wearing her small clippy to keep her hair back. c. Boston Mamas Christine keeps her hair back with a stretchy headband. 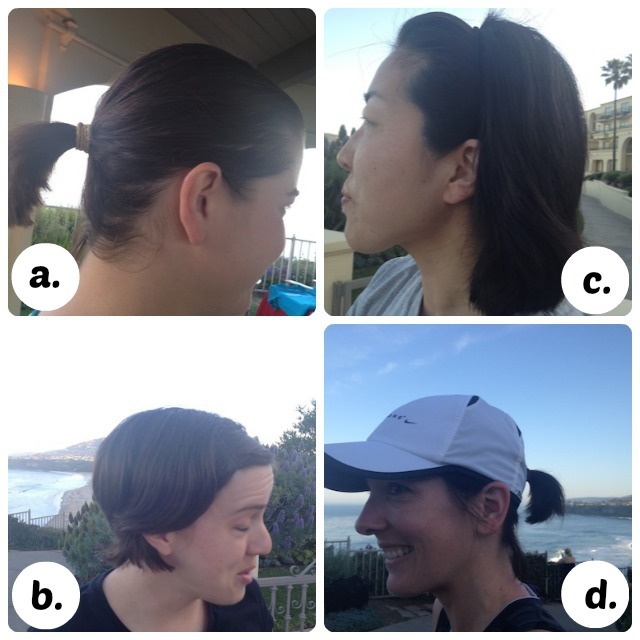 d. Musings of a Housewife Jo-Lynne Shane has my go-to look: the ponytail with running cap is easy to do and keeps the hair, sweat, and sunshine out of my face. e. Something else entirely. Not pictured are your other creative ideas. Do you fashion a bun or braid? Go free and flowing? So, what’s your favorite running hairstyle? And is it different on race days? Mine is usually braided or in a pony with a headband. Sometimes in the winter I wear it down because it keeps me warmer. I actually have been planning on getting a summerweight running cap like Jo-Lynne’s — since I have bangs, I sometimes have hair problems (crazy spikiness) when I try to use bands etc. I’ve run with a cap for YEARS but I think I left it at the beach. Probably some bunny from the Ritz has my old Nike hat now. Time for a new one. I loved it. The headband is cute but no sun protection. And always BRAIDS for triathlons! I can’t stand any hair on my neck when I’m running, so I sport a high, messy bun with a headband to keep my flyaways in check! If it’s sunny, I’ll wear a visor to keep the sun out of my eyes. Catie, I’d love to see the messy bun. That works well for my favorite running time of day: post-bed-head.